He lends his name to one of London’s best small museums but who was the person behind the name the Geffrye Museum? Details about his life are somewhat scant but it is generally believed Sir Robert Geffrye (among a number of variants of the spelling of his name) was born around 1613 in the village of Landrake near Saltash in Cornwall. Moving to London while still just in his teens, he is believed to have undertaken a seven year apprenticeship, eventually admitted as a member of the Worshipful Company of Ironmongers and freeman of the City of London. It’s been suggested he was an ironmonger in name only but it seems to be the case that his new status gave him the opportunity to launch his career as a merchant and he apparently made a fortune from investing in African and East Indian trade. Geffrye – who married Priscilla Cropley, a lawyer’s daughter, at the chapel in the Mercer’s Hall in Cheapside in 1651 and lived in Lime Street – was twice Master of the Worshipful Company of Ironmongers (first in 1667 and then again in 1685). He was knighted by King Charles II in 1673 (his coat-of-arms can still be seen in the Ironmonger’s Hall) and in 1674, he was appointed a sheriff of London before being elected Lord Mayor in 1685 (his wife Priscilla had died in 1676). In 1688, Geffrye became president of Bridewell and Bethlehem Hospitals – a role which he held for two years and which apparently saw him attending Bridewell every Friday to judge and sentence prisoners. He died in February 1704 and was buried in the now long-gone St Dionis Backchurch, where his wife had been buried earlier. Their remains were transferred to the almshouses grounds after the church was demolished in 1878. Geffrye left behind a substantial fortune and, along with bequests to family, friends and charities, he made a sizeable bequest which funded the building of 14 almshouses in Shoreditch (now home to the Geffrye Museum which this year celebrates its tercentenary) (for more on the museum and alms houses, see our earlier posts here and here). 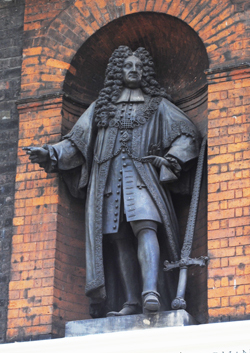 A replica of an original 1723 statue of Sir Robert still adorns the almshouses which bear his name (pictured above). For more on the people that made London, see Boris Johnson’s Johnson’s Life of London: The People Who Made the City That Made the World .